Chanteuse Country US née Myrna Joy Miller, le 29 Novembre 1941 à Phoenix (Arizona). 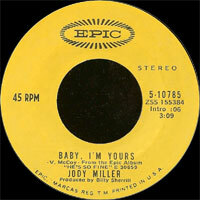 Billed early in her career as "The Little Girl with a Big Voice", Jody Miller was Capitol Records most promising young female Vocalsist in the 1960s. In an era of petite belters who could shake the rafters with their powerful voices (Brenda Lee, Connie Francis, Lesley Gore, Timi Yuro, et al. 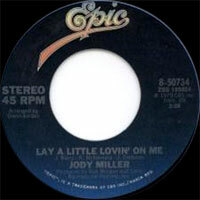 ), Jody was, for a time, the Capitol Tower's contender for the title of Pop Music's Top Princess. A five-foot three-inch blend of girl-next-door beauty and charm, the dark-eyed brunette began her career singing folk songs in college coffee houses in Oklahoma before making her exodus to the west coast and a successful appearance at Hollywood's Troubador nightclub. Almost overnight, an encounter with westerns film star Dale Robertson brought her to the attention of Capitol Records executives, who promptly offered Jody a recording contract. Several fascinating singles followed---including the dramatic pop smash "He Walks Like A Man", the controversial, hippie protest anthem, "Home of the Brave", the mournful (and brilliantly written) "Long Black Limousine", and Jody's Grammy®-Award winner tribute to America's Domestic Goddesses, "Queen of the House". 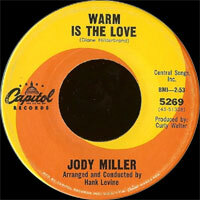 During this time, Jody cut seven albums for Capitol and made numerous appearances on national TV, performing alongside The Righteous Brothers, Sonny and Cher and The Rolling Stones on such wildly popular dance shows as Shindig, Hullabaloo, American Bandstand and Hollywood A Go Go. For several frenetic years in the 60s, Jody toured Hawaii with The Beach Boys, entertained the U.S. Air Force in Alaska with Bob Hope, and performed shows with everyone from Herb Alpert and the Tijuana Brass to Don Rickles. In the middle part of the decade, along with several other recording artists of the day, she also pioneered the music video format in some groundbreaking and eye-popping films for the Scopitone movie jukebox. A true road warrior, Jody's musical journey has literally taken her around the globe ---from England and Italy, to Japan and the Philippines. For 15 years, Jody was a major attraction in both Las Vegas and Lake Tahoe, where she drew huge crowds at The Sahara, The Riviera, Harrah's and The Desert Inn Hotels with her energetic and musically diverse shows. Switching over from folk and pop to more country-oriented music in the 1970's, she gained an even wider audience with eight successful albums for Columbia Records in Nashville, before retiring to her Oklahoma farm to breed and raise quarter horses with her husband Monty Brooks. Returning to recording in the 1990s, Jody cut over a half dozen gospel albums (earning her induction into the International Country Gospel Music Association Hall of Fame in 1998 and her being named 1999's Entertainer of the Year by the Country Gospel Music Guild), and has now resumed performing her country and pop hits in her shows. Throughout her entire career, Jody has proven to be such a gifted and versatile Vocalsist that it has often made classifying her as a singer almost next to impossible. In the past, however, this versatility in several different musical styles often created a dilemma for Jody when dealing with an industry so intent on pigeonholing performers. Exactly where, on the musical continuum, did she belong? The lady herself once asserted, "I love all music...from opera to the blues. One newspaper reporter once said my voice was smoky, but she really meant bluesy, I think. I could never be categorized. 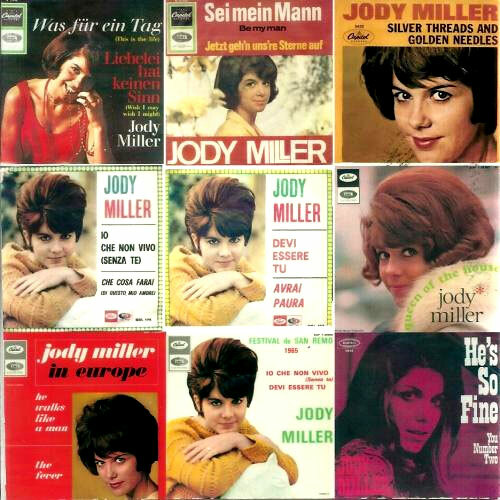 Maybe I shoulda done Broadway tunes..."
With questioning her proper musical niche long a thing of the past, Jody Miller has amassed a multitude of awards, accomplishments and fans in a multi-faceted career that in 2008 sees her nearing the half-century mark in show business. With her rich and resonant voice wonderfully intact, here's hoping that Jody will continue spreading some good news --through some great music-- for many years to come. 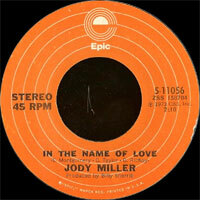 - John O'Dowd, author of the Discoveries magazine article: "Jody Miller: The Little Girl With a Big Voice"